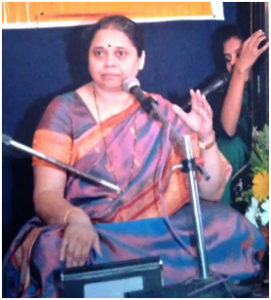 Madhuvanti Deo is an exponent of the Jaipur-Atrauli gharana. She holds a master’s degree in music from SNDT University, Pune. She is fortunate to have received his training from stalwarts of the gharana like Rajabhau Deo (an exponent of Kirana and Jaipur gharanas), Madhusudan Kanetkar (disciple of Bhurji Khan), Alka Deo–Marulkar (daughter and disciple of Rajabhau Deo), Kumudini Katdare and Kishori Amonkar. Having received her training from very senior gurus, she is considered an authority on the Jaipur-Atrauli tradition. Apart from presenting raag-sangeet, she also sings Thumri, Dadra, and allied genres. She is the recipient of the ‘Gaan Hira’ award in the year 1982.